Enologica Vason and Ju.Cla.S. 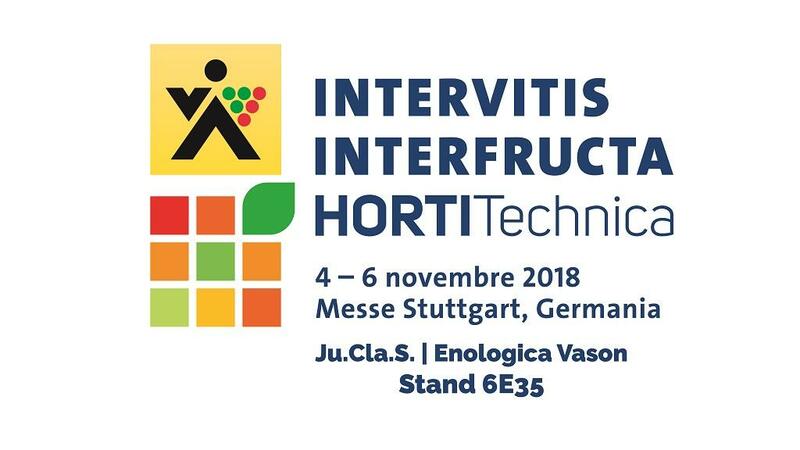 will be presenti anche quest'anno ad Intervitis Interfructa Hortotecnica, che si terrà dal 4 al 6 Novembre 2018. Come and visit us @ STAND 6E35! - “Viticulture 4.0” and “Campus 4.0” will illuminate current digitalization trends and innovative products and services from young companies. - “Energy-efficient viticulture” will present practical solutions for energy-efficient through to energy-independent viticulture. - “Risk management” is the name of the pavilion which will examine the increased risk of harvest failures and adequate strategies for harvest protection, as well as effective prevention measures. - “Plant protection” will feature measures and products which are used in anti-resistance management or in mechanical processes.